Former middleweight champion Anderson Silva will return at UFC 234 and if he gets a win over rising star Israel Adesanya, he's getting the next shot at the title. 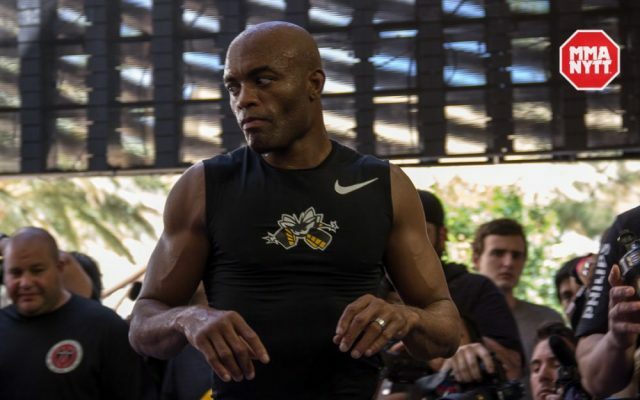 UFC legend Anderson Silva has often said he wanted to make one more run at the middleweight title before he retires and it appears he’s one win away from that opportunity. On Friday night, UFC president Dana White confirmed that if Silva can get past rising star Israel Adesanya at UFC 234 in February that he will get the next middleweight title shot. “It’s true,” White confirmed about Silva’s potential title shot. “I haven’t seen [Anderson] in a while, I flew out to Los Angeles and we sat down and talked. I told him I wanted the Israel Adesanya fight and he says ‘I’m just coming back and how does that make sense for me?’ and I said it makes sense for you because if you win, I’ll give you the title shot. He said ‘now you’re talking, buddy, I like the way you’re thinking’. White didn’t say if the same reward awaits Adesanya if he defeats Silva at UFC 234. The upcoming card in Australia will feature in the middleweight title fight in the main event as current champion Robert Whittaker defends his belt against Kelvin Gastelum. Silva will square off with Adesanya in the co-main event with the promise that a win will get him another crack at the middleweight title. Silva is the longest reigning middleweight champion in UFC history but he’s fallen on harder times of late. Silva has gone just 1-4 with one no contest over his past six fights. Still it appears at 43 years of age, Silva is one win away from getting back into the title picture.